October 9-10, 2018 | New York City, NY. 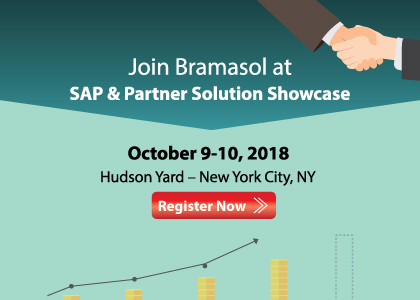 Bramasol Inc. is excited to announce that we will be participating at SAP Finance Partner and Solution Summit on October 9–10 at SAP Executive Briefing Center at Hudson Yard – New York City, NY. Plan to join Bramasol and learn the latest about our technology innovations and solutions for challenges facing the Office of the CFO. As leaders in compliance solutions, Bramasol’s experts will share knowledge on its rich set of management and visualization tools that help businesses dive deep into their S/4 journey.